The fast-growing list of corruption investigations in Spain have involved almost every institution in the country: the major political parties, the royal house, the supreme court or the national bank, just to mention some of them. Everyday, new information and a new case is released/unveiled, provoking an increasing sense of indignation. It is also true that the levels of indignation have reached an apex, that they cause either incredulity or insensitivity. I decided to test PageOneX, a tool to visualize the evolution of stories on newspaper front pages, to see how the coverage on corruption was being made. It is a good moment to do so, now that we, at the Center for Civic Media, are currently developing it. We hope to have a fully functional version by the end of the month, but you can always test the online alpha version or install the code locally. You can also get involved in the testing and development, it is open source. This post is based on another I wrote in Spanish Es lo mismo pero no es igual in my blog. 1. Corruption or not corruption? 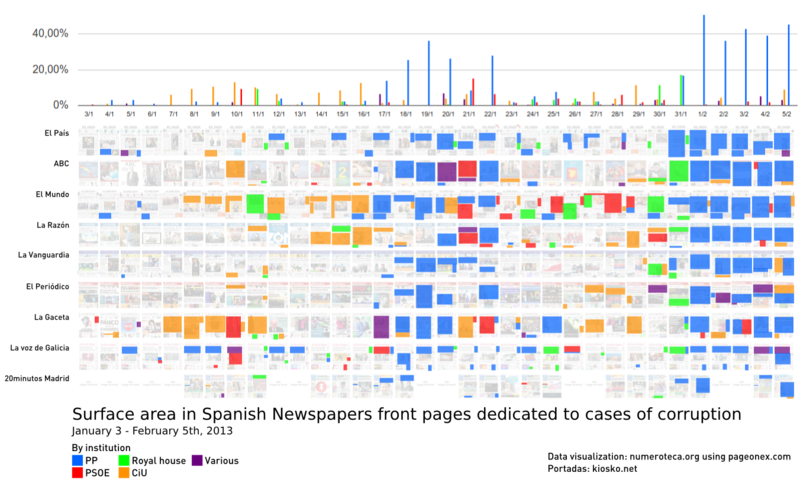 The hypothesis and common ground knowledge is that every Spanish newspaper is usually aligned with a political party. They usually follow the corruption cases of the ‘opponent’ parties. Measuring the coverage in the front page seemed a good proxy to analyze their political agendas and to verify the hypothesis. 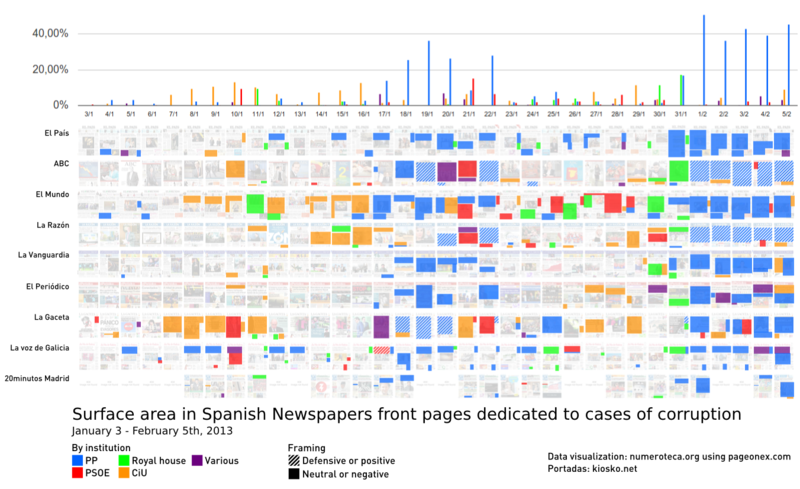 I selected 9 Spanish newspapers and highlighted the stories related to corruption cases in the last days until February 5th, 2013. There are two big ‘black’ clusters: after Jan. 17th, when El Mundo published that the ruling party ex-treasurer, Bárcenas, had a $29 million swiss account, and after January 31st, when the excerpts from the party’s parallel financial accounts were published by El País. Both scoops drain all the other newspapers to talk about the same PP corruption case. To see in detail what the different newspapers were talking about we needed to analyze first the corruption cases by institution. PP (Partido Popular): conservative party. Blue. PSOE (Partido Socialista Obrero Español): center-left social democrat. Red. CiU (Convergència i Unió): conservative Catalan nationalist. Orange. And the royal house, where the son-in-law of King Juan Carlos, is being investigated. Green. 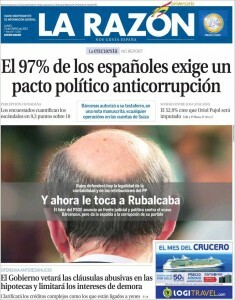 Both newspapers, El País and El Mundo, are in opposite political spectrums, but in this case they made a common cause to cover the Bárcenas story that affected the conservative party Partido Popular (PP) in the government. El País has centered its coverage in the PP (blue), leaving little space to CiU (orange) or the monarchy, and none to the PSOE (red, affected by Amy Martin case). 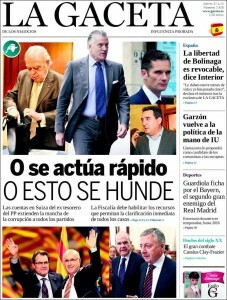 El Mundo has a colorful timeline involving all the major corruption cases. Being usually a defender of the PP and attacking PSOE, there is an ongoing debate about why this change might have happened. Some people suggest that El Mundo might be pushing for a change and renovation inside the conservative party. 3. How are they telling the story? However, if we look closer to our analysis, some things might not fit in the alignment of mass media with certain major political parties. All of the newspapers are talking about the PP corruption case, but not in the same way. To understand how they are framing the story we need a framing analysis. 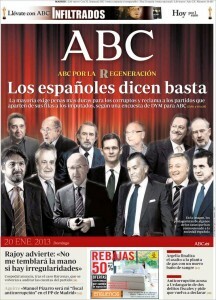 ABC, a monarchist and conservative newspaper, is dedicating their entire front pages to the PP corruption case, but after the first news on January 18 claiming for “el PP debe aclarar la verdad del caso Bárcenas” (PP must tell the truth about the Bárcenas case), they started defending the actions PP was taking. ABC corruption coverage. Stripped areas means defense or positive framing. I added a new layer to the visualization: whether newspaper were framing corruption neutral or negatively (plain areas) or defending and giving a positive view (stripped areas). The conservative newspapers (ABC, La Razón, La Gaceta, but not El Mundo, that had published the scoop) took a defensive position (Jan. 19-20). It is also worth noting that after El País released the excerpts of the parallel financial account (Jan. 31) La Gaceta, far to the right newspaper, stopped defending the PP. In Spain, mass media are usually blamed for maintaining and supporting the bi-partisan system (PP-PSOE, both parties are the ones which have more corruption cases, check the Corruptodromo map). This time, some newspapers are playing a fundamental role unveiling corruption cases, but most of them keep reporting only about certain ones. Only a well-informed citizen, that escapes the biased point of view of its reference newspaper, can get the full picture of what is happening and react consequently. The draft of the “Law on Transparency, Access to Public Information, and Good Governance” has been published recently in Spain. It contains many exceptions, that would narrow its scope and would not apply to some institutions such as the royal family or the political parties. Open-data and other advocacy groups are claiming for fundamental changes before it is approved. Meanwhile the President of Spain, and president of PP, Mariano Rajoy, pledged to provide “complete transparency” about the corruption case in a televised address, but, at the same time, he didn’t accept any questions. Note about the analysis: only the two most important news articles from every front page were analyzed. The cases of the Bank of Spain and NovaGalicia were left out of this visualization. 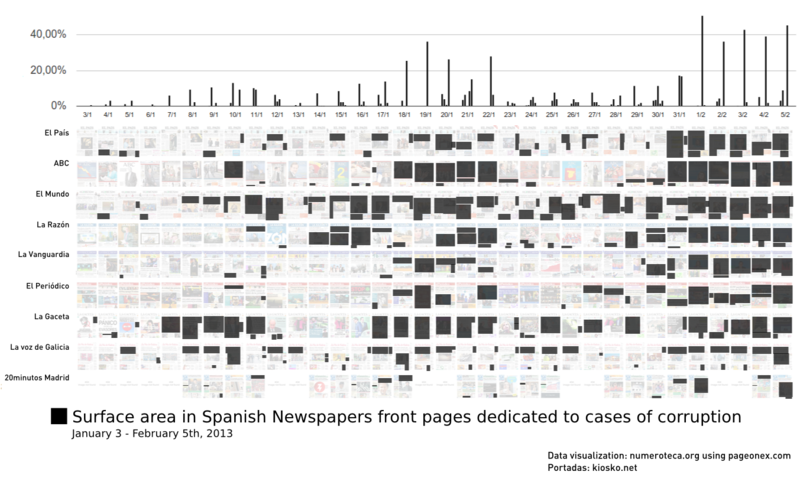 You can also check the online version of this visualization. Thanks Rogelio Alejandro López for the copy-edit and to Elena. This post has been cross-posted to the Civic Media blog.